In the classic view, an educated population is one of the most important components of a vital, healthy state. In this light Virginia shines, increasing its citizens' level of education attainment in every category and outperforming its peer states and the nation in high school and Baccalaureate degrees and beyond. Educational attainment measures the education level of people currently living in Virginia. It is a long-term indicator of the investment that a state or region has made in developing and attracting human capital. This indicator provides a "big picture" assessment of a state's or region's quality of life, workforce preparedness and economic potential. 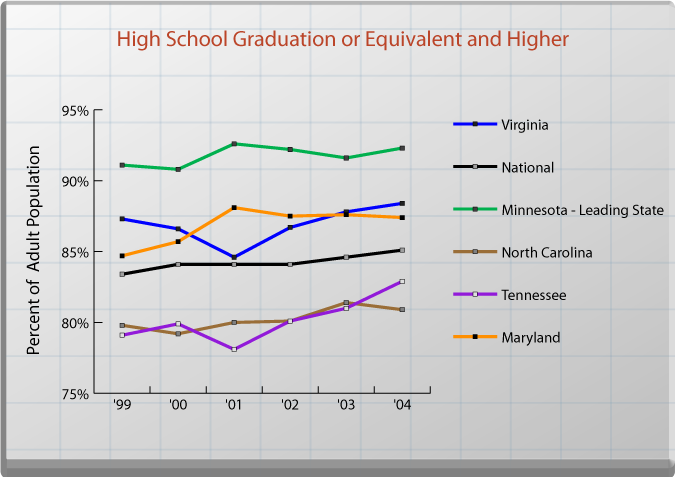 Virginia's educational attainment is relatively high. In 2004, Virginia ranked 15th in the nation for the highest percentage of its adult population (25 years or older) with at least a high school degree and ninth for adult population with at least a Bachelor's degree. 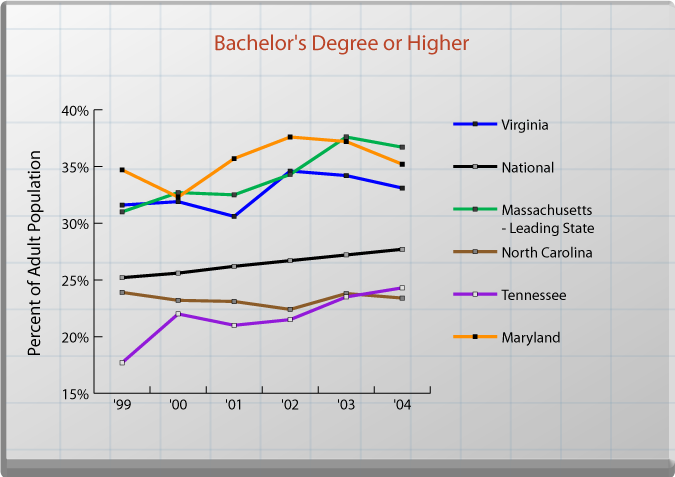 After a low in 2001, Virginia has steadily increased its percentage of adults with at least a high school degree to 88.4 percent in 2004, exceeding the national rate of 85.1 percent. The percentage of the adult population with at least a Bachelor's degree increased from 31.6 percent in 1999 to 33.1 percent in 2004, with some fluctuation during the interim period, exceeding the national rate of 27.7 percent. Virginia is behind Maryland's rate of 35.2 percent, but above North Carolina at 23.4 percent and Tennessee at 24.3 percent. Massachusetts led the states in 2004 with a rate of 36.7 percent for a Bachelor's degree or above. 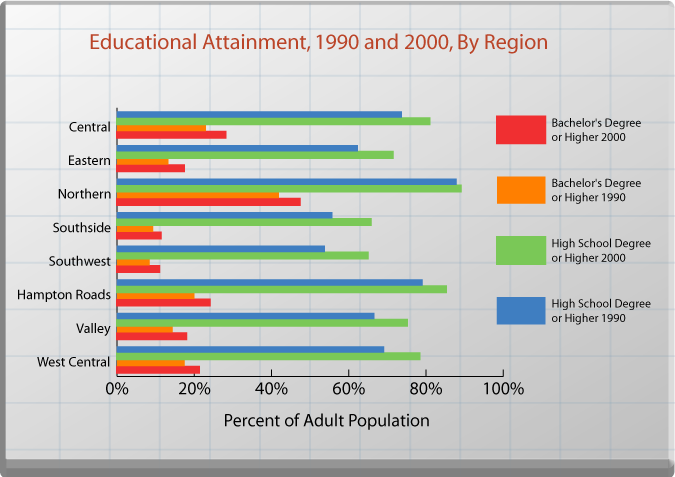 Educational attainment increased in every region across Virginia between 1990 and 2000. All regions increased both their high school- and college-educated population, with Northen and Hampton Roads regions having the highest high school educated population and Northern and Central regions having the highest college educated populations. A number of factors influence educational attainment, including availability of educational services, the quality of those services, responsiveness of educational institutions to the particular needs of a community or region, affordability, regional culture, economic opportunity, and migration into and out of the state. The state's role is to ensure that adequate infrastructure exists; provide programs that promote educational attainment; provide career services and awareness of occupational-related education, skills, and training; and increase economic opportunity by facilitating a good business climate. The Virginia Honor Schools Grant Program and the Early College Scholars and Commonwealth Scholars programs increase high school curriculum rigor to move the Commonwealth's schools to excellence. Project Graduation provides remedial academies and online tutorials to provide additional opportunities to help students meet high school competency standards. The Race to GED is a workforce initiative whose goal is to meet or exceed 20,000 Virginians passing the General Educational Development (GED) Tests annually. Middle College provides Virginia high school dropouts between the ages of 18 and 24 an opportunity to attain a GED on a community college campus. The Early College Scholars program allows eligible high school seniors to satisfy high school diploma requirements while earning at least 15 hours of transferable credits toward a college degree. The Virginia Virtual AP School provides a variety of Advanced Placement (AP) courses, enabling students to earn college credit regardless of their high school's ability to offer college-level courses. Systemwide transfer and articulation agreements provide clear expectations for transfer of students and credits between community colleges and four-year colleges. Path to Industry Certification encourages students who are not planning to attend college immediately after graduating from high school to continue pursuing technical training for a selected industry certification. Career Coaches are community college employees placed in local high schools to increase the number of high school graduates prepared for employment and/or community college enrollment in a career and technical field. Career Pathways are designed to improve student recruitment and retention in postsecondary programs in science, math, engineering and technology areas. Pathways include articulation and dual enrollment, experiential learning and workforce readiness skills development as well as career coaching and planning. The Commonwealth College Course Collaborative provides a set of academic courses students may take in high school that fully transfer as core requirements and degree credits at Virginia colleges and universities. The VirginiaMentor website offers access to information and admissions applications for public and private colleges and universities within Virginia, and includes an Early College Scholars Transfer Tool that shows students how to maximize the amount of college credit they earn in high school. VirginiaMentor is a student services website representing the public and private colleges and universities of Virginia. Gaining Early Awareness and Readiness for Undergraduate Programs (GEAR UP) is a federal grant program administered by the State Council of Higher Education for Virginia (SCHEV) that funds partnerships among middle and high schools, postsecondary schools, community organizations and businesses to help qualified students enter and succeed in postsecondary education. These partnerships provide tutoring, mentoring, and information on college preparation and financial aid, while emphasizing the need for core academic preparation. Other programs with similar missions include Project Discovery and An Achievable Dream.